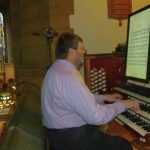 Kevin Bowyer, Glasgow University Chapel Organist (Scotland, UK), has performed and broadcast all over the world, and has released around ninety recordings, including all of Bach’s organ music for the Nimbus recording label. His recital repertoire is enormous and ever expanding; in an article restricted to European organ music of the twentieth century, he mentions over one hundred composers whose music he has played. 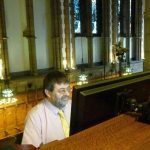 Though he sees contemporary music as his vocation, he plays organ music from the Renaissance and Baroque periods onwards, and has shown an appreciation for the qualities of historical instruments in such music. Kevin tells the story of how during a recital he discovered he was having real difficulty reading his paper music. 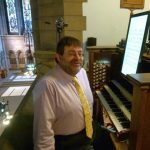 Worried he might have to stop playing because of his eyesight, he remembered a demonstration of Power Music, Cambron had given to the Glasgow University Chapel Choir. He contacted us and the result was a revelation! Kevin now uses a 27 inch touch screen system installed on the organ console in the Chapel and has a 24 inch portable system,both running Power Music Professional. I use the system exclusively now for everything. It’s so much easier and more convenient than paper. My library is currently at 5188 songs, many of them being volumes of 100 pages or more. About 100 GB altogether and no noticeable slowing down.